The replanted World War Two Avenue of Honour also commemorates the loss of lives and devastation to property in the Ash Wednesday bushfires of February 1983. On February 16, 1983, a series of bushfires swept across South Australia and Victoria resulting in the loss of 75 lives and the destruction of more than 3,000 buildings. This plaque commemorates the men and women from the Naringal District who enlisted for the 1939-45 war. The original memorial plantation being destroyed in the Ash Wednesday fires. 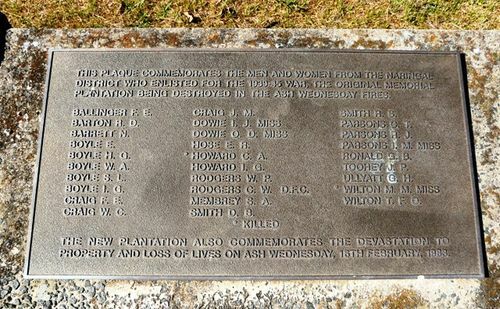 The new plantation also commemorates the devastation to property and loss of lives on Ash Wednesday, 16th February, 1983.